As a busy CIO or technology leader, it sometimes seems impossible to think strategically about transformation when you’re already struggling with existing platforms, business requests and sometimes creaking legacy technology. This is often coupled with the company’s leaders having a very different view on the necessity of digital initiatives. Digital transformation isn’t a choice anymore, it’s a necessity and I’ve been working with business and technology leaders for several years, helping them to understand the process and objectives of digital transformation, how to get the right strategy, get buy-in from senior leadership and executives and how to get the digital journey on the right track. So to help you do the same, this article talks about the three key requirements to ensure your leadership and strategy is effective and supports your digital transformation. Digital transformation is driven by strategy, not technology. It’s a line we’ve all heard countless times. That’s because it’s completely true! Less digitally mature organisations tend to focus on individual pieces of technology rather than a holistic digital strategy and the outcomes that new, digital opportunities can deliver. A true digital transformation strategy should include a shared vision for transformation, and the pathways or outcomes required to deliver the vision. This in itself is a completely new way of thinking and can be difficult to achieve for companies who are low down on the digital maturity curve. Find out if you're ready. Do you want to know if your organisation is ready for digital transformation? If you want to find out, take our short questionnaire and get your Digital Readiness Grade along with a free 22-page report packed full of insights and recommendations based on your answers. For hundreds of years, companies have created hierarchies and the older the company, the more layers of the hierarchy there are. This was absolutely the right way to manage business before the digital age. The hierarchy model ensures that a steady state is achieved and that standardised product and service offerings are maintained. Change is structured and assessed and led only from the top of the hierarchy. While that was absolutely the right way to manage business before the digital age, it's the exact opposite of what your company now needs to do and aligning your leadership to the new way of working will be extremely challenging, but absolutely essential. The legacy model has been totally invalidated by the pace of digital change, the unevenness of customer needs and expectations and the ease of which personalisation can be achieved through digital technology, which means that standardised products and services fail to meet the requirements of today's digital customer. This issue is exacerbated by the people at the top of the hierarchy being unaware of the need for change until well after issues have arisen at the customer level. Along with confusion and disagreement over the cause of issues and the required remedial activity and not knowing where to start. This often causes further, large-scale IT type programmes to be initiated. For executives to understand that digital transformation isn’t an IT-led initiative is critical. Standard linear change is a route to failure. The standard and very normal way for most companies to change is a very linear progression. This linear progression of thought and change no longer aligns to the external change of the digital age. The graph below, while just a representation, shows how external thinking and expectation has overtaken internal thinking and pace of change. Internal change and internal thinking. 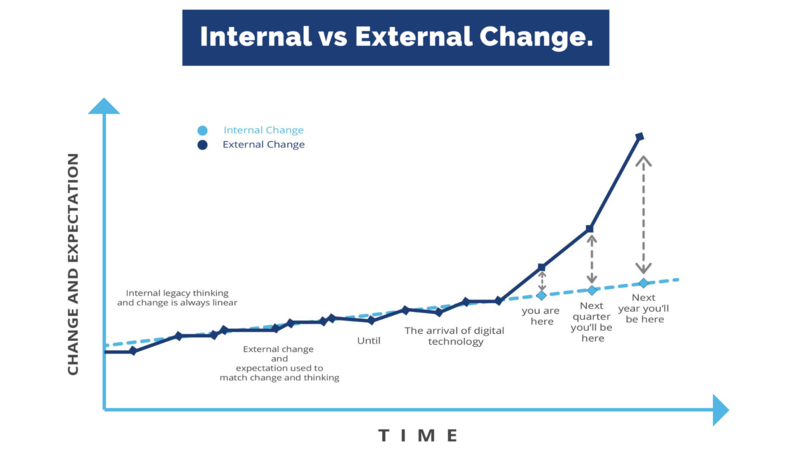 The image clearly shows that If the company maintains it’s current ways of working, thinking and change then the ever steepening rate of external digital change and expectation continues to get further and further out of reach of the company. This will invariably mean one thing, failure. The good news is that most executives are starting to understand that digital transformation is imperative for the survival of the business, even if they don’t necessarily understand the process. Digital transformation isn’t a set piece of change with a defined end. Executives, especially of pre-internet companies find setting sail towards an unknown destination a very daunting prospect, and the natural inclination is to avoid weighing anchor for as long as possible. To get your digital transformation underway, you need a vision which is shared across the entire company and a strategy which identifies the pathways to digital, or “digital destinations” which help to deliver the vision. These digital destinations are usually a combination of digital products and digital outcomes. It’s important however to take this one step at a time and always remember that people don’t buy what you do, they buy why you do it. So, aligning the most senior and influential leaders in your company before going out to the wider stakeholder community is vital for success. Outline your digital transformation vision. The shared vision should identify in short but meaningful statements, the changes needed to enable the company to continuously deliver value to customers, as well as improving continuous internal change and fostering a mindset of innovation. Select members of your company's leadership to be involved and collaborate to create the vision for transformation, and as quickly as possibly write an initial draft and continue to share and revise. This document is a working document. It doesn’t need to be perfect and should not be delayed. This is the time for action, not perfection, and it should be approached in the same way as any other digital project. It should clearly define the changes needed to close the gap between your company’s current service offerings and your customers’ expectations. If your leadership team still doesn’t recognise the importance of transformation, then it's likely you'll have an uphill battle on your hands and that could be seriously detrimental to any progress you intend to make. You're going to need to engage them with something that matters to them. Think about the personal goals or ambitions of your company's leaders. Try to incorporate these outcomes into the shared vision. Start with the most influential leaders and senior people in your company. Turn your strategy into a short, easily digestible presentation to get support. Remember this isn’t a large document. Don’t talk about technology! Most senior leaders are technically more out of date than you, and indeed most of the employees in the business and often talking about particular technology just causes anxiety and can cause your digital transformation to sound like an IT upgrade. To get them to see the 'big picture' focus on the potential outcomes. Include data around your customer retention numbers. Remember it is always cheaper to keep a customer than to win a new one. If your lack of digital offerings is causing customer retention issues then this is a big ticket item in support of transformation. Coupled with the Shared Vision, there must be a leadership group responsible for both starting, driving and maintaining the digital programmes and initiatives across the company and a management function to coordinate the activities across the organisation necessary to achieve the objectives of the digital programme. Successful coordination of these activities results in a sustainable digital delivery culture. This function can be called a Digital Portfolio Office. The Digital Portfolio Office is especially important in digital transformation programmes because of the cross-functional nature of the work being undertaken. You will need a motivated and digitally aware leadership group in order to remove barriers and free up staff from business as usual activities, especially in the early stages of transformation. So following the advice in this article, you’ll have a clearly defined ‘Shared Vision’ with leaders who are bought into transformation, a strategy to get where you need to be and a digital portfolio office to ensure the successful delivery of your digital initiatives across the organisation.